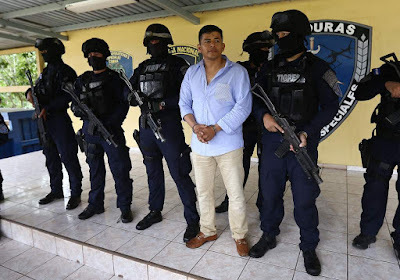 Honduran national Sergio Neftali Mejia-Duarte was sentenced today to life in prison for his involvement in a large-scale international narcotics transportation organization. Acting Assistant Attorney General John P. Cronan of the Justice Department’s Criminal Division; U.S. Attorney Benjamin G. Greenberg for the Southern District of Florida and Special Agent in Charge Adolphus P. Wright of the U.S. Drug Enforcement Administration (DEA), Miami Field Division, made the announcement. On Jan. 9, a Miami jury found Mejia-Duarte, 41, guilty of conspiring to distribute over five kilograms of cocaine with the knowledge that the cocaine would be unlawfully imported into the United States. The evidence at trial, which included the testimony of multiple co-conspirators and pictures from a seizure of over 2,000 kilograms of cocaine, showed that defendant Mejia-Duarte led a large-scale international narcotics transportation organization based in Honduras and Guatemala that was part of a distribution chain spanning from Colombia to Mexico and the United States. In that role, Mejia-Duarte and his workers secretly received multi-hundred kilogram quantities of cocaine from Colombia and Panama, temporarily stored the narcotics in Honduras or Guatemala, and then transported the narcotics onward, typically northward, including into Mexico. Mejia-Duarte used go-fast boats, helicopters, and airplanes to operate his shipping route and, as witnesses detailed at trial, much of the cocaine was supplied to the Sinaloa Cartel led by Joaquin Guzman Loera, also known as “Chapo,” and Ismael Zambada, also known as “Mayo.” Based on the witnesses’ trial testimony and documents submitted in the case, Mejia-Duarte is responsible for trafficking at least an estimated 20,000 kilograms of cocaine. In operating his criminal network, the witnesses described how Mejia-Duarte carried guns, employed bodyguards and assassins, and engaged in a bloody war with a rival trafficker. During Mejia-Duarte’s arrest, Honduran law enforcement officers found a Glock pistol and an automatic rifle in the closet of the bedroom where he was residing. The prosecution was part of Operation Hollow Point, which is a result of the ongoing efforts by the Organized Crime Drug Enforcement Task Force (OCDETF), a partnership between federal, state, and local law enforcement agencies. The OCDETF mission is to identify, investigate, and prosecute high-level members of drug trafficking enterprises, bringing together the combined expertise and unique abilities of federal, state, and local law enforcement. Assistant Deputy Chief Michael Lang of the Criminal Division’s Narcotic and Dangerous Drug Section (NDDS) and Assistant U.S. Attorneys Walter M. Norkin and Joseph Schuster of the Southern District of Florida are prosecuting the case. The governments of Honduras and Colombia, the Criminal Division’s Office of International Affairs and DEA Division Offices in Honduras and Colombia assisted in obtaining the conviction against Mejia-Duarte.